DOYLESTOWN – Staff and board members from Bucks County’s domestic violence organization A Woman’s Place (AWP) were on hand in Washington D.C. yesterday to witness an important milestone – the renewal of the Violence Against Women Act (VAWA). The VAWA extension bill passed the house with a bi-partisan vote 263-158. The bill, which funds domestic violence agencies like AWP as well as sexual assault agencies and other services across the country, was originally passed into law in 1994 and has required periodic reauthorization by congress. While this reauthorization has typically been a bi-partisan effort without too much conflict or debate, congress was unable to come to an agreement to reauthorize VAWA when it expired in 2018 and instead had chosen to make small extensions to the existing law until an agreement could be reached. In response to this extended deadlock and ongoing pressure from the community and groups like A Woman’s Place and the Bucks County Women’s Advocacy Coalition, Bucks County Congressman Brian Fitzpatrick, along with Congresswoman Karen Bass (D-CA) crafted HR 1585, a bill to not only re-authorize VAWA, but to make it stronger by adding additional protections and funding. “This is a great bill” said Jennifer Hinds, AWP’s Director of Advocacy and Outreach. “This is exactly what we, our sister organizations, and our national coalition were looking for. We knew it would be tough to get this bill through, but we’re really happy with the result.” Ms. Hinds had already been to the Capitol a few weeks previous to this vote when she was invited by Congressman Fitzpatrick to speak at a press conference announcing the bill’s introduction. Opponents of the bill objected to some of the new funding and protections in the bill, most notably the portion of the bill that closes the so-called “boyfriend loophole” in the existing law. Under the existing VAWA law, gun ownership is banned for anyone convicted of stalking or abuse if the abuser was the spouse or domestic partner. The new law extends these protections to abusers who are in dating relationships but aren’t married or living with the victim. According to reports from the Pennsylvania Coalition Against Domestic Violence, there were a 117 domestic violence-related fatalities in 2017, 78 of which were from firearms. This is the highest total for Pennsylvania since 2011. Studies have shown that the presence of a weapon in the home during a domestic violence dispute increases the likelihood of homicide by 500%. Additional new protections in the bill include much needed extensions of funding and programs for Native American populations, as well as increased penalties and enforcement of cyberbullying and cyberstalking. 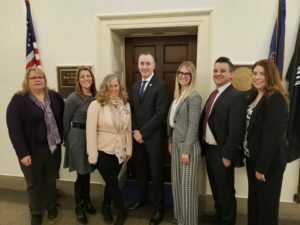 AWP staffers and board members, along with representatives from Network of Victim Assistance (NOVA) in Bucks County were invited by Congressman Fitzpatrick to witness the debate and vote on the bill. “It was such a powerful and interesting experience to be invited to the House of Representatives for this historic vote,” said AWP Director of Development Jesse Steele. Passage of the bill was not a sure thing. Moments before the deciding vote, opponents of the bill attempted to introduce a substitute bill that would instead re-authorize the existing VAWA. While a so-called “clean reauthorization bill” would ensure current levels of funding for organizations like AWP, simply extending the existing law would remove the new protections and funding advocates for HR 1585 had fought so hard to include. This “clean reauthorization” was defeated narrowly in the house and HR 1585 was able to come to the floor for a vote. The bill now moves to the US Senate where its passage is anything but assured. “With strong political forces now aligned against the bill, it will be up to the incredible advocates and citizens who pushed this bill through the house to make sure we push it through the Senate too,” Ms. Hinds said.